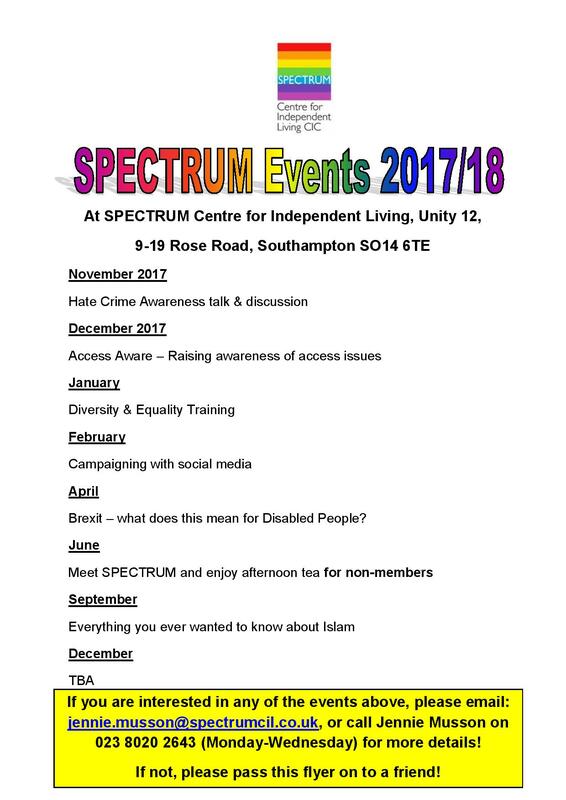 Become a member, it’s free and you’ll be supporting SPECTRUM in its aims and work. SPECTRUM works as an organisation to affect long-term and lasting change in the way Disabled People are viewed, included and valued for who they are and what they contribute to society. 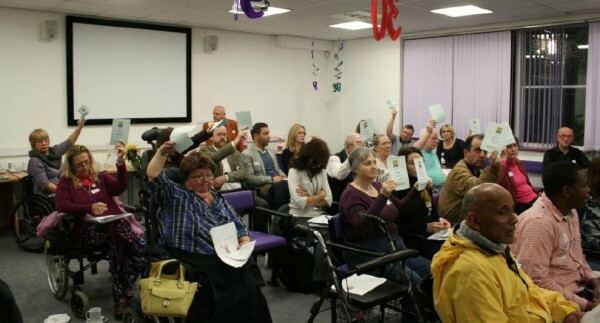 By being an effective organisation that is representative, accountable and led by Disabled People our mission is to help Disabled People to realise their full potential by exercising choice and control to live an independent lifestyle. As a service provider SPECTRUM strives to be involved with designing and delivering services that are personalised, empowering and enabling for users and cost effective for commissioners. You do not have to be a member to access our services. SPECTRUM is a membership organisation of Disabled People and our non-disabled allies. If you support our aims, we encourage you to become a member and help to work to achieve these aims. for Disabled People only. In addition to the general benefits of membership, Full Members have a direct say in issues affecting SPECTRUM and are able to vote at Annual General Meetings. for our non-disabled allies. Associate members are encouraged to contribute their views on organisational issues but cannot vote at Annual General Meetings. Membership of SPECTRUM is FREE of charge. Membership is open to anyone aged 14 years or over who lives or works (paid or unpaid) within the geographical boundary of the county of Hampshire. You will receive a quarterly newsletter keeping you up to date about SPECTRUM’s latest work and projects and topical issues in a lively and informative way. You will have the opportunity to take part in campaigns on issues of importance to Disabled People. You will be the first to hear about job and volunteer opportunities at SPECTRUM. Members are welcome to contact the Management Committee or visit the office at any time. You will be invited to SPECTRUM events. You will be able to attend our Annual General Meeting. But the main benefit is that you will join others who support SPECTRUM in its aims and work. Yes, membership is currently free. You have to be over 14 years of age and live or work in the geographical county of Hampshire. You also have to agree with SPECTRUM’s aims to become a member. Do I have to be a Disabled Person to become a member? No membership is open to non-disabled people as well who can apply to become Associate members, although they do not have voting rights. Associate Members are encouraged to fully engage with discussions and their views are taken into account when making organisational decisions. Fill in a form either in our membership leaflet or on-line through our website. You have to agree to our organisational aims and sign up to our philosophy of Independent Living to become a member. What benefits do I get from being a member? You will be invited to SPECTRUM meetings and events. Once a year SPECTRUM holds it’s Annual General Meeting and you will get the opportunity to influence the way the organisation is run and elect the Management Committee, Auditors etc. You will receive a quarterly newsletter, and mailings (postal, electronic at your request). You will be informed about job opportunities. Yes, once a year you will be sent a renewal notice where you have to agree to sign up to SPECTRUM’s aims and objectives for the next year. Why did SCIL change its name to SPECTRUM? Ever since 1984, SCIL has had ‘Southampton’ in its name, even though much of our work has been outside of Southampton. Increasingly, we found people have assumed we only worked in Southampton, which resulted in us supporting less people than we should, simply through a misunderstanding. We have always worked with Disabled People from all impairment, age and equality groups. However, some people assume we only support people with physical impairments. So, we wanted to ensure our new name removed this misunderstanding too. We believe our new name more accurately communicates the diversity of the people we support, across all equality, impairment and age groups; as well as the diversity of the different work that we do. The SPECTRUM of colours in the logo represents positivity, diversity, vibrancy and enlightenment. Click to see our calendar of events for the rest of 2017 and 2018. Non-members are always very welcome to come along too! To become a member, please fill out the membership form below. Alternatively you can download the form and send it back to us by email or in the post. I confirm that I am aged 14 years or over and live or work (paid or unpaid) within the geographical boundary of the county of Hampshire. I agree with SPECTRUM’s aims (as detailed above) and wish to become a member. SPECTRUM holds member’s details on a computer database. This list will not be shared with anyone else and will only be used to distribute SPECTRUM information. SPECTRUM complies with the Data Protection Act.